The Climate Prediction Center recently issued its 90-day outlook for temperature and precipitation for the U.S. It also updated the drought monitor tool. In general the outlook calls for the next three months to feature above normal temperatures in the western third of the country and in the far southeastern states. Alaska and the Pacific Northwest will also be warmer than usual. Below normal temperatures are confined to much of Texas and areas of adjoining states. Most of the country will see an equal chance for above or below normal temperatures. Much of the nation may experience above normal precipitation from the southeast through the gulf states to the western plains and Rockies along with a good portion of Alaska. The above normal rainfall may bring drought relief to Texas and the four corners area. 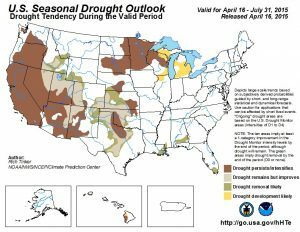 The Great Lakes states will see below normal precipitation and the potential of a developing drought. Lake levels and fire danger may be impacted. The drought monitor shows little change in the near term for the hardest hit areas of the west, parts of Texas, and parts of the Dakotas, Minnesota and Wisconsin. Over the 90 day period of the outlook, the drought may ease in Texas and areas northwest of there. However, drought conditions may expand in the Great Lakes. Unfortunately, little or no relief is seen for California. Just this week water use restrictions of from 8% to 36% were enacted for some municipalities. Late breaking news. Tornadoes in Germany! There was a fairly broad outbreak of severe weather including tornadoes in Germany on Tuesday, May 5. Here’s coverage from the British newspaper, The Guardian.